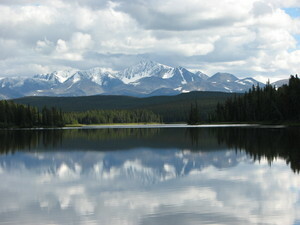 Teztan Biny is part of the Tsilhqot’in homeland and the Taseko River / Fraser River watershed. At Teztan, Nabas, and Jididzay, Tsilhqot’in families have hunted, trapped and fished, and gathered medicines in their traditional way of life for decades, just like their ancestors, the Esghaydam, did before them. Today, Teztan is still a beautiful and powerful place where they go to practice their culture and preserve their way of life. Since settlers came into their land, they have worked hard to protect their culture and their way of life from the settlers destructive ways. Now Taseko Mines Ltd. wants to build a huge mine there. They want to cut the trees, tear up the land, and make a lake of poisoned waters there, forever destroying this lake. We do not want to see Teztan Biny/Fish Lake and the lands and waters poisoned and destroyed for short-term gain. We want to see it preserved for our lives, for our children, and for our grandchildren after them. We all say ‘No’ to this mine and the destruction of the land and our clean water resource. 2848 people have signed this petition.